"When this is over, Mrs. Thompson, people are going to say that you were a big part of this." The Long Walk Home tells the story of prejudice and perseverance in the South at the time of the Alabama bus boycott. It is a film not with overblown scenes of prejudice and racism, but with numerous smaller and more touching scenes of two women breaking against the racism that surround their lives. The film wisely shows that the strains were felt by all those wishing to stand up against the injustices. Miriam Thompson (Spacek) is a perfectly content housewife in the Deep South in 1955. Her husband Norman (Schultz) is a powerful man in the community who also happens to be overly bigoted. Their housekeeper is Odessa Cotter (Goldberg), a black woman who dutifully takes the bus to work each day and does her job serving the Thompson's. One day, Rosa Parks makes her landmark stand against racism and prompts a bus boycott. Knowing what Rosa Parks was going through, Odessa begins to walk to the Thompson house, even if it means getting up several hours early and developing health problems in her feet and legs. Seeing that Odessa is walking to work everyday, Miriam offers a ride to Odessa without the Norman's knowledge. What follows is a friendship that forges a bond that will last forever, as well as a discovery in Miriam of which her husband does not approve. It would be easy for The Long Walk Home to fall into melodramatic trappings, but the script by John Cork wisely allows the story to largely be told from the personal perspectives of both Miriam and Odessa. The slow pace of the film does well to help us understand the emotions of the characters. We see the strain of a tough marriage in Miriam's eyes and we see it change when she begins to take a moral stand against the racist oppressors. I also liked the way in which the bigoted townspeople are not overblown caricatures. It is clear that their positions and beliefs are wrong, but they are not made to be villains. Instead, they are simply misguided individuals who come to see that their beliefs are unjust. The performances are uniformly, and expectedly, terrific. Spacek gives an understated piece of work; her scenes with Goldberg have a restrained and believable quality. You can see that she is a strong individual and her emotions are perfectly portrayed. Goldberg is every bit the equal of Spacek as she offers a much showier performance, but her work is grounded as well. Look for fine supporting turns from Ving Rhames and Dylan Baker as opposing protagonists. Image Transfer Review: Presented in a full-frame transfer The Long Walk Home is simply a poor transfer. Colors bleed and are muted while the image has a haze throughout. Sharpness and detail are poor given the haze, while there are a few moments where edge enhancement is noticeable. This is simply a bad transfer for a very good film. Audio Transfer Review: The Dolby Surround track is not as lively as other releases, but it gets the job done. Dialogue is the main star and it sounds crisp with nice definition and very few to no dropouts. The remaining speakers provide little support aside from the musical score. Extras Review: No extra features are provided. There are however 18 chapter stops available for selection. 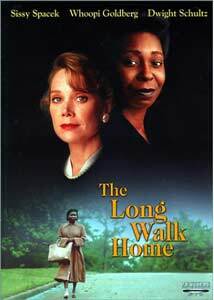 I would have liked to have seen more historical extra features on this DVD for The Long Walk Home, as the film itself deserves to be shown as part of a history lesson for children about this ugly time in American history. Nonetheless, it is a film worth seeing.